Glycogen synthase kinase-3 (GSK-3) is a widely expressed and highly conserved serine/threonine protein kinase encoded in mammals by two genes that generate two related proteins: GSK-3α and GSK-3β. GSK-3 is active in cells under resting conditions and is primarily regulated through inhibition or diversion of its activity. While GSK-3 is one of the few protein kinases that can be inactivated by phosphorylation, the mechanisms of GSK-3 regulation are more varied and not fully understood. Precise control appears to be achieved by a combination of phosphorylation, localization, and sequestration by a number of GSK-3-binding proteins. GSK-3 lies downstream of several major signaling pathways including the phosphatidylinositol 3′ kinase pathway, the Wnt pathway, Hedgehog signaling and Notch. Specific pools of GSK-3, which differ in intracellular localization, binding partner affinity, and relative amount are differentially sensitized to several distinct signaling pathways and these sequestration mechanisms contribute to pathway insulation and signal specificity. Dysregulation of signaling pathways involving GSK-3 is associated with the pathogenesis of numerous neurological and psychiatric disorders and there are data suggesting GSK-3 isoform-selective roles in several of these. Here, we review the current knowledge of GSK-3 regulation and targets and discuss the various animal models that have been employed to dissect the functions of GSK-3 in brain development and function through the use of conventional or conditional knockout mice as well as transgenic mice. These studies have revealed fundamental roles for these protein kinases in memory, behavior, and neuronal fate determination and provide insights into possible therapeutic interventions. Tight control of cell-cell communication is essential for the generation of a normally patterned embryo. A critical mediator of key cell-cell signaling events during embryogenesis is the highly conserved Wnt family of secreted proteins. 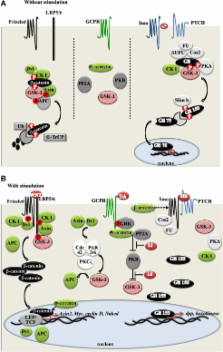 Recent biochemical and genetic analyses have greatly enriched our understanding of how Wnts signal, and the list of canonical Wnt signaling components has exploded. The data reveal that multiple extracellular, cytoplasmic, and nuclear regulators intricately modulate Wnt signaling levels. In addition, receptor-ligand specificity and feedback loops help to determine Wnt signaling outputs. Wnts are required for adult tissue maintenance, and perturbations in Wnt signaling promote both human degenerative diseases and cancer. The next few years are likely to see novel therapeutic reagents aimed at controlling Wnt signaling in order to alleviate these conditions. Journal ID (publisher-id): Front. Mol. Neurosci. Copyright statement: Copyright © 2011 Kaidanovich-Beilin and Woodgett. Synergism between COX-3 inhibitors in two animal models of pain. Immunological profile of animals exposed to pesticide--deltamethrin. Nrf2 is controlled by two distinct β-TrCP recognition motifs in its Neh6 domain, one of which can be modulated by GSK-3 activity.